The apterae of Myzus persicae are generally yellowish-green (see first picture below) but vary from whitish or pale yellowish green to mid-green, rose-pink or red (see second picture below). They are often darker in cold conditions. The antennae are 0.7-1.0 times the body length, reaching to the siphunculi. Their siphunculi are slightly swollen towards the darkened tips and are 1.9-2.5 times the length of the rather pointed cauda. 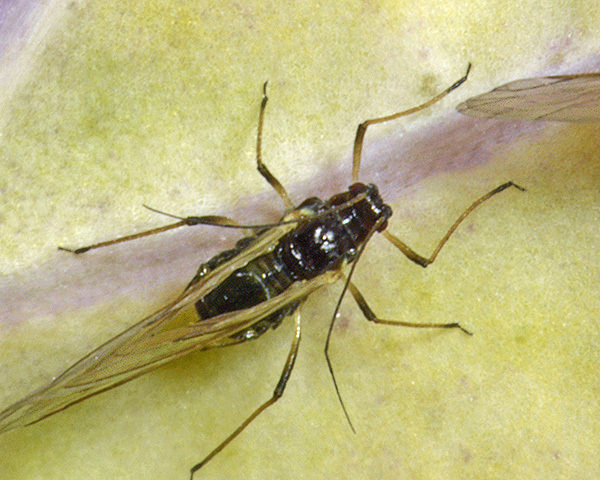 The body length of Myzus persicae apterae is 1.2-2.3 mm. The alate Myzus persicae (third picture above) has a solid pigmented area occupying the mid-abdominal dorsum from segments 3 to 6, as well as further bars on adjoining segments. The two pictures below are micrographs of an aptera (note the slightly swollen, dark-tipped siphunculi) and an alate, both preserved in alcohol. 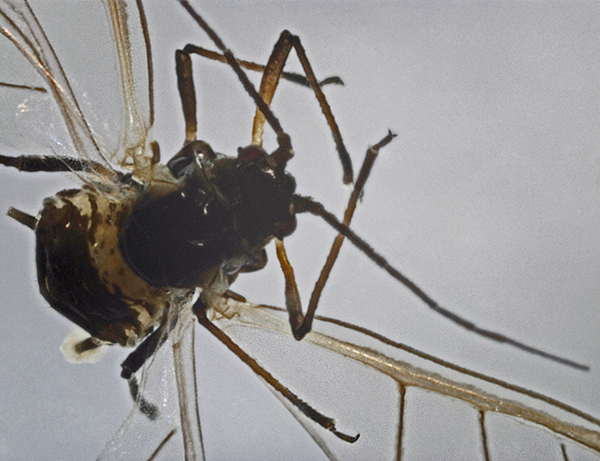 The clarified slide mounts below are of adult viviparous female Myzus persicae : wingless (from the secondary host), and winged. 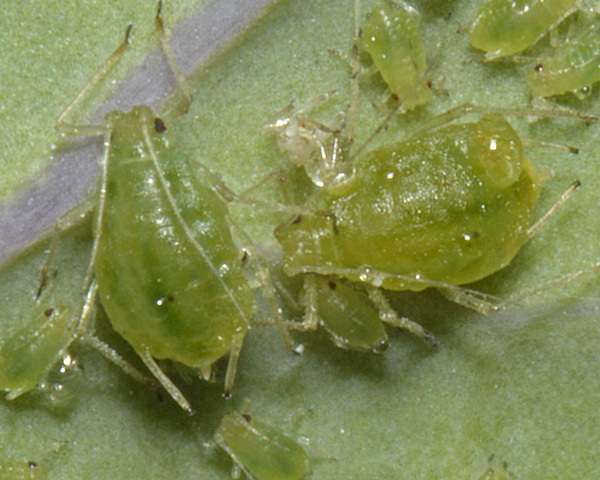 The peach-potato aphid does host alternate where the primary host - peach (Prunus persica) occurs. Eggs are laid on the primary host and spring colonies curl the young leaves. However, most of the population overwinters as mobile stages on herbaceous plants and brassicas. Myzus persicae is a major pest on its summer hosts including potatoes, sugar beet, lettuce, brassicas and legumes, mainly because it transmits a number of important plant viruses. Whilst Myzus persicae is a polyphagous generalist, the subspecies Myzus persicae nicotianae is a tobacco specialist. Myzus persicae has been recorded on 33 species of the Prunus genus. Blackman & Eastop list 24 species of aphid as feeding on peach (Prunus persica) worldwide, and provide formal identification keys. 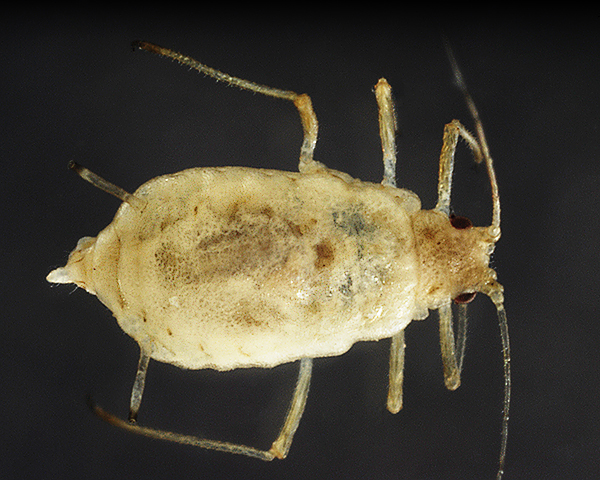 Of those aphid species, Baker (2015) lists 16 as occurring in Britain: Aphis aurantii, Aphis fabae, Aphis gossypii, Aphis spiraecola, Brachycaudus amygdalinus, Brachycaudus helichrysi, Brachycaudus persicae, Brachycaudus schwartzi, Macrosiphum euphorbiae, Myzus cerasi, Myzus persicae, Myzus varians, Rhopalosiphum maidis, Rhopalosiphum nymphaeae, Rhopalosiphum padi and Rhopalosiphum rufiabdominale. Myzus persicae has been recorded on 31 species of the Solanum genus. Myzus persicae has been recorded on 3 species of the Beta genus (Beta bengalensis, Beta maritima, Beta vulgaris). Blackman & Eastop list 22 species of aphid as feeding on beets (sugar beet, beetroot, chard, mangelwurzel, Beta vulgaris) worldwide, and provide formal identification keys. 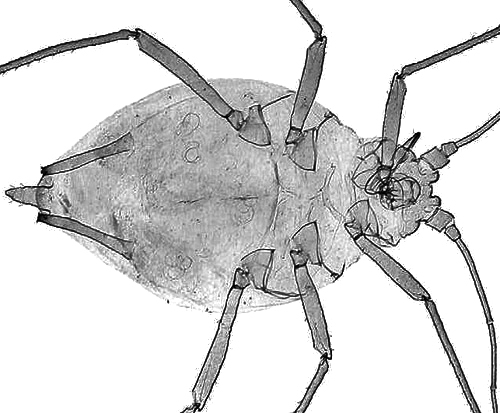 Of those aphid species, Baker (2015) lists 18 as occurring in Britain: Aphis craccivora, Aphis fabae, Aphis gossypii, Aphis nasturtii, Aphis sambuci, Aphis solanella, Aulacorthum solani, Brachycaudus helichrysi, Brevicoryne brassicae, Hayhurstia atriplicis, Macrosiphum euphorbiae, Macrosiphum stellariae, Myzus ascalonicus, Myzus persicae, Pemphigus fuscicornis, Rhopalosiphoninus latysiphon, Rhopalosiphoninus staphyleae tulipaellus and Smynthurodes betae. Myzus persicae has been recorded on 4 species of the Lactuca genus (Lactuca floridana, Lactuca sativa, Lactuca spicata, Lactuca serriola). Myzus persicae has been recorded on 8 species of the Brassica genus (Brassica juncea, Brassica napus, Brassica nigra, Brassica oleracea, Brassica rapa, Brassica madritensis, Brassica racemosus, Brassica rigidus). Myzus persicae has been recorded on 2 species of the Phaseolus genus: Phaseolus coccineus and Phaseolus vulgaris. 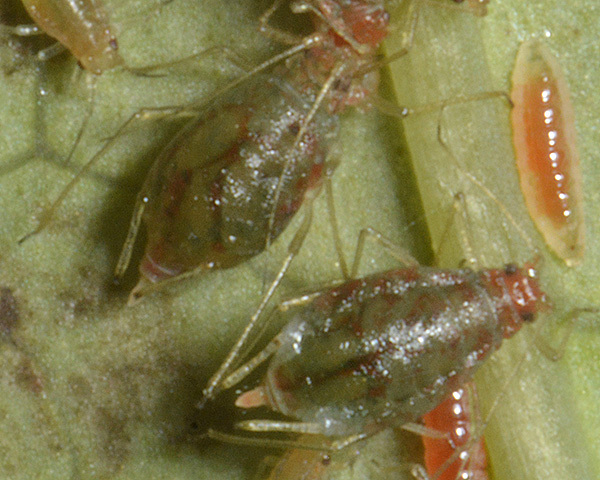 Blackman & Eastop list 19 species of aphid as feeding on runner bean (Phaseolus coccineus) &/or French bean (Phaseolus vulgaris) worldwide, and provide formal identification keys. 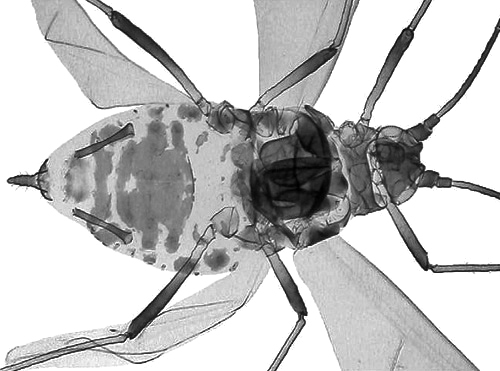 Of those aphid species, Baker (2015) lists 12 as occurring in Britain: Acyrthosiphon pisum, Aphis craccivora, Aphis fabae, Aphis gossypii, Aphis nasturtii, Aulacorthum solani, Macrosiphum euphorbiae, Myzus ornatus, Myzus persicae, Rhopalosiphoninus latysiphon, Smynthurodes betae, and Therioaphis trifolii. Our particular thanks to Roger Blackman for images of his clarified slide mounts. We also thank Hadlow College for their kind assistance.